Vectors are a composition of points that form lines which in turn are used to form shapes. When combined, it is known as a vector. Utilizing the postulate, we can convert an image to vector known as vector artwork. The whole point about using vectors is to create artwork to make an image that is scalable to any extent without losing its resolution and quality. Normally, the two commonly used types of images used in the printing industry are Raster and Vector images. 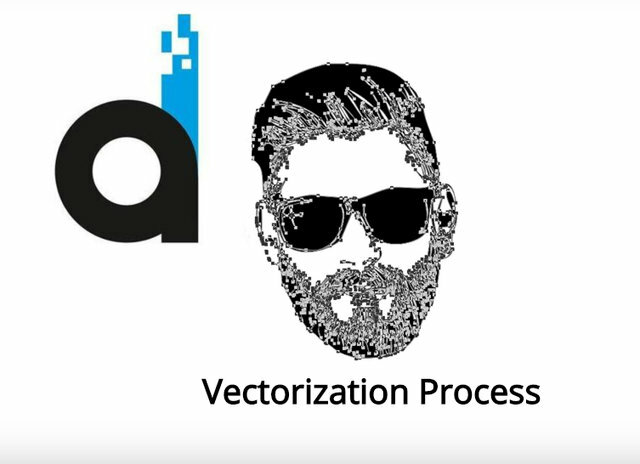 The evolution of vectors does not relate to artwork or fashion in any way. It was first used by the military and the air traffic control. The first use related to design dates back to the 1960s. Sketchpad, a software patented in the name of Ivan Sutherland, enabled vectors to be used for graphics and design. In the beginning, a single vector file required massive storage space resulting as a huge hindrance to be used commercially. Moreover, it became known as an expensive method to produce artwork. Alternatively, raster images, commonly known as bitmap images gained popularity as they required less storage space. For decades, they were widely used as the most preferred method to store images and pictures digitally. As computer technology evolved and storage sizes didn’t matter anymore, vectors again started surfacing. A variety of software were also introduced that allowed users to save in lower file sizes. Soon vectors became widely accepted because saving a file was no more a problem without losing their scalability and originality. What is Raster – Bitmap Image? Raster image format renders as pixels, minute squares mapped on a grid of two dimensional picture. Every image stored in the said format is a cluster of pixels each holding information about the color and its position according to the X and Y axis coordinates. All photographs that are taken by a camera or scanned images are raster images. Their quality relies on the performance of the lens they are captured with. Low quality pictures tend to pixelate very quickly when you zoom out in order to rescale them, as compared to high resolution. But, still, there is a limit to how much a raster image can be zoomed before you start seeing the jagged edges. Raster images are saved in JPEG, JPG, PNG, GIF, and TIFF file formats. As opposed to raster which uses pixels to store information and form an image or a picture, vector art uses mathematical algorithms. The information they store contain the position of dots, lines, curves, and shapes along with color details. Since its information is based on numbers and formulas, it does not require much storage space. Vectors are not resolution dependent, hence, they are flexible and can be zoomed to any scale without pixelating ever. The image always stays sharp and crisp no matter how big or small you make it. With the advent of printing machines and the adoption of computers by small businesses, the advertisement industry witnessed an unprecedented boom. From brochures, pamphlets, books, billboards, to textile printing, household items such as crockery, stationery and more, the demand for scalable graphics skyrocketed. Advertisement opportunities knew no boundaries and every manufacturer was keen to approach experts in graphics imagery to help them convert an image to vector which was probably their logo. Thus began the era of branding which is still considered as the key to success. The beauty of vector images is, once created, you never have to worry about resizing it by a designer. Today, the use of vector graphics is limitless and advertisement is not only about brochures and flyers anymore. The world yearns for custom printing and it feeds on vectors to fulfill business demands. Customized printing shows no sign of slowing down, in fact, the demand is increasing as it expands to more markets with the launch of new products and many innovations to follow. Without a doubt, the internet has played a key role in promoting businesses all across the globe. As it is accessed through a variety of devices with different screen sizes, scalability issues arise and the demand to convert an image to vector for online use becomes inevitable. T-shirts, trousers, and jackets are printed with various designs selected by designers. It is necessary to convert an image to vector before forwarding the selected design to the printing department. The printing process on fabric is affordable and the most widely used in the industry. It helps to customize and create a larger variety for consumers without having to change the entire apparel. The ever-growing demand of vectorizing in the industry is a clear indication that apparel printing is here to stay for a long time. There are different ways to print images and designs on cloth. Screen Printing is one of the oldest and the most popular methods used in the garments industry, suitable for bulk printing at the lowest cost. Today, it all starts with a raster image handed over to the designer who is asked to convert it to a vector image. Clearly, the image needs to be resized when creating a screen of it. The screen, as it is widely known is made by mounting the image on a fine mesh. If the image needs a variety of colors, stencils are used to cover the parts of the image where a particular color is not required. By squeezing the required color in the open area, it is transferred to the fabric. Stencils are adjusted accordingly by squeezing the colors until the design is complete. Also called DTG printing process, it is a modern technique where a design is directly printed on fabric by using a digital printer. The process is simple, it works in the very fashion you would print a file on a paper, but the printers used are specially designed for fabrics. But before sending an image for printing, it is necessary to convert the image to vector. Otherwise, the outcome would be pixelated. DTG is relatively easy and not messy as compared to screen printing. Although setting up the printing machine is not too expensive, but owing to its slow speed it hasn’t gathered much fame when tackling bulk production. Just as the name explains it, utilizing this method, manufacturers are able to print their designs by heating it on the garment. It is just like pasting a sticker but to actually paste it, heat is applied to the design to melt it down and transfer on the garment. With modern technology at hand, it is easy to control heat evenly and apply enough pressure without breaking the image. Today, these machines are available from a variety of manufacturers. No matter what brand is being used, the concept remains unchanged. The designer is required to convert the image to vector and forward it to the printing department who then follow their production procedure. Are you a printer? A manufacturer? Or an artist who works on the canvas? Are you searching for a professional who can convert your image to a vector with zero mistakes and that too at extremely low cost? If your answer is yes then you have reached the right place. 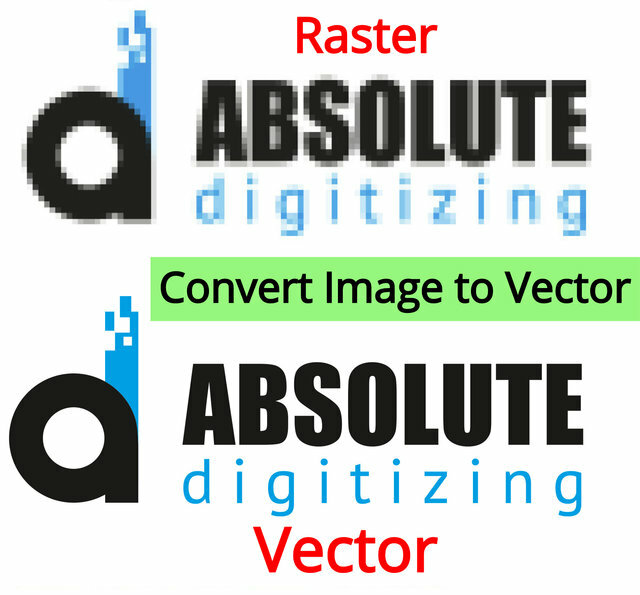 We, Absolute Digitizing are experts in converting raster images to vectors. With over a decade of experience, we have worked on thousands of designs and have provided excellent services to our customers. Our unmatched services are available for only $10 per artwork. We focus on quality and commitment above everything else. If you are in need of urgent services, do let us know and we’ll ensure you get flawless designs within the deadline. Get a Vector Conversion Quote now!